You can use HTTP Posts and Webhooks in Drip to send data back to your WordPress site when a contact’s profile has been modified, or tags have been added or removed. You can also automatically generate new WordPress user accounts for Drip subscribers. 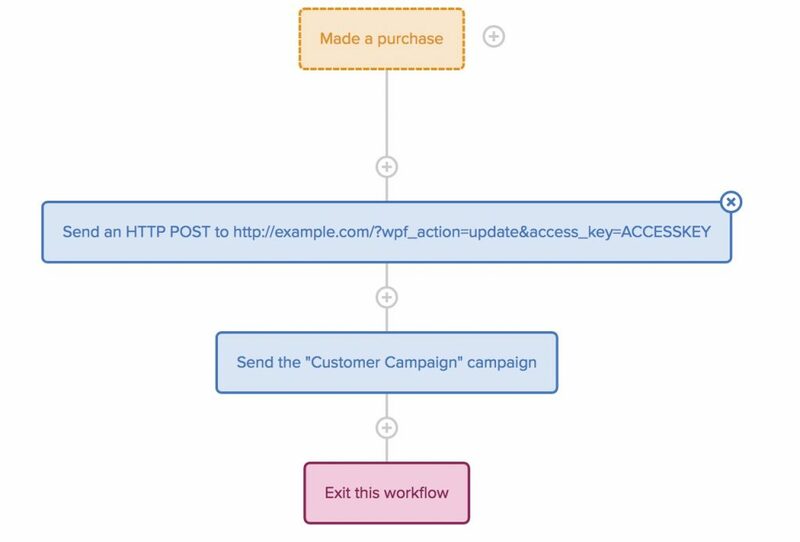 Using an HTTP Post in Drip allows you to send data back to WordPress as part of an Automation, or via a Rule based trigger. You can set this up by navigating to the Automation tab in Drip. 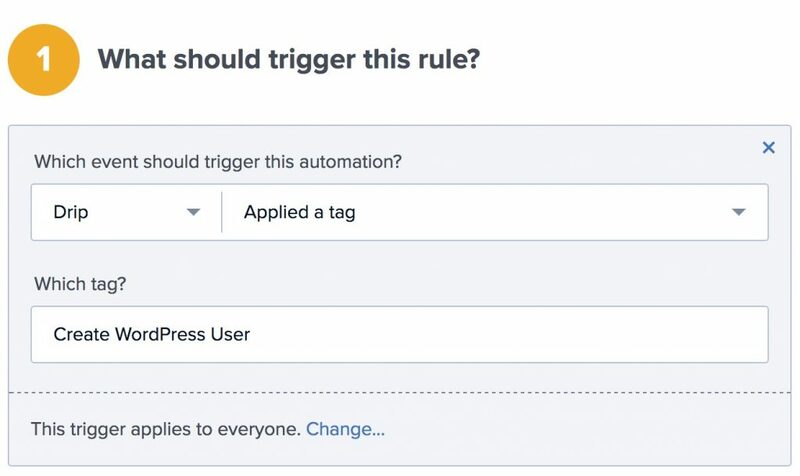 To create a rule-based trigger, head to the Rules tab and create a new rule. First set the criteria which will trigger the rule. In this case, we’re telling Drip to send the HTTP Post whenever the tag “Create WordPress User” is applied to a subscriber. In the second panel, select “Send an HTTP post” from the dropdown. For the Endpoint URL, enter the URL to your site. In this example, we’re triggering the creation of a new WordPress user when the tag is applied. This is achieved by using wpf_action=add in the URL. You also need to supply your access key, which can be found from the WP Fusion settings page on your site. Note: By default, user accounts will be created with their email address as the username and a randomly generated password. However, if you have created a custom username field and password field in Drip, and enabled these fields in WP Fusion for sync with user_login and user_pass on your website, the new users will be given the usernames and passwords stored in their Drip subscriber record. 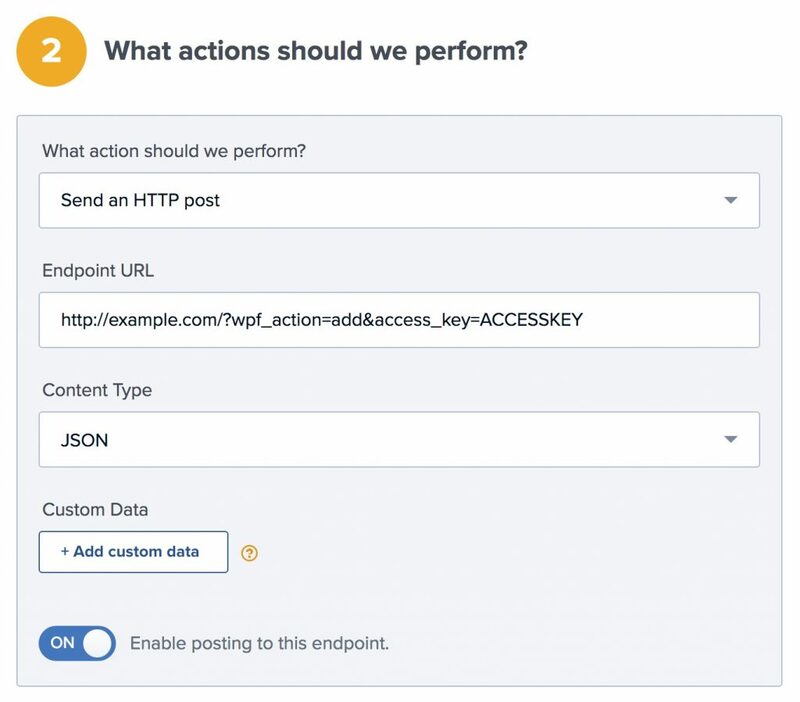 You can also trigger an HTTP Post as part of an automation. Add a new node to the automation and follow the same steps outlined above. New user accounts will be created with an automatically generated password. If you’d like to use this password in your email marketing, you can send the password back to Drip after it has been generated. In the Webhooks section of the General settings tab, check the box for Return Password, and select a field in Drip where the password should be stored.